Microfiber towels are the back bone of a top quality detail and really make high quality detailing possible. 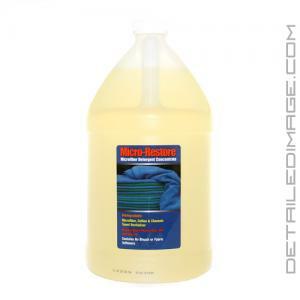 After investing time and money in to premium microfiber towels it's really important to preserve them with a top quality detergent like the Micro-Restore. Microfiber towels have hundreds of thousand of ultra soft micro-pores that are open and can grab and collect particles, which is why they are soft effective at cleaning. However this also makes cleaning the microfiber products more challenging than traditional materials. The Micro-Restore is very unique in it's ability to safely remove contaminants, keep the micro pores open and soft. This formula uses an optimized blend of chelating agents, emulsifiers, surfactants, and builders in an aqueous system, removing all foreign particles from the microfiber towel. Dirt, oils, grease, wax, polish, etc. can be very difficult to remove but the Micro-Restore makes it quick and easy. The water softening agents inside the formula remove calcium, magnesium and other minerals found in water that can prematurely fade microfiber towels. Best of all this formula contains absolutely no fabric softener or bleach. While many other detergents claim to have none they still use small traces which can degrade and stiffen the microfiber towels over time. Pour 2 ounces in large loads and 1 ounce in smaller loads of laundry. If you have heavily soiled towels or an extra large washing machine then 3 - 4 ounces may be needed for best results. When you are done the towels will look clean, feel soft and work great! When using the DI Micro-Restore I notice the towels are fluffier, meaning the fibers are more separated from each other rather than matted together with product and contamination. This not only means the towel is not as soft, but it is not going to perform as well. That is the biggest takeaway and the best benefit of using it. 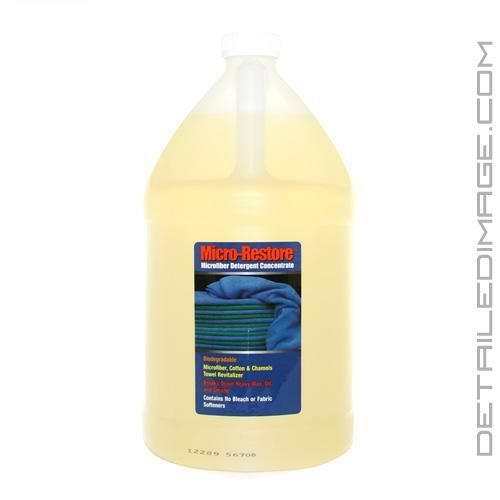 Micro-Restore Detergent is a special blend of surfactants, emulsifiers, and water softeners that are optimized to remove heavy oils, waxes, dirt and protein stains from microfiber, cotton, and chamois products. It provides excellent cleaning performance to effectively and safely remove most of these elements and suspends them for removal in the rinse cycle while neutralizing the negative effects of hard water. Micro-Restore maintains high performance and prevents deterioration through many cleanings. For full loads add 2 ounces, for smaller loads add 1 ounce. Remove cap and seal from one ounce receptacle. Squeeze bottle to fill receptacle with necessary amount. Pour in wash. For heavily soiled products add 1 ounce to a 5 gallon bucket filled with water and let soak. As has been stated by so many others, this product really does work. MF towels get so soft they literally feel better than new. Won't get leafy materials, etc. out if you happen to drop outside when wet (ask me how I know) but otherwise is truly remarkable. Highly recommended. This stuff is excellent. I too thought it might just be hype, but it works extremely well. Highly recommended. This is my first time using this Micro-Restore Microfiber Detergent; I just followed the directions, put a measured 2 Oz. in one of my 5 Gallon Buckets of hot water and let a bunch of my Microfiber Cloths soak for a few hours, then dumped them into our washing machine; they came out really nice, good and soft. I'll buy more when I'm close to the end of this bottle.